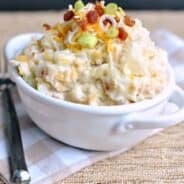 Summer salads are perfect for 4th of July or bbq’s with friends and family. 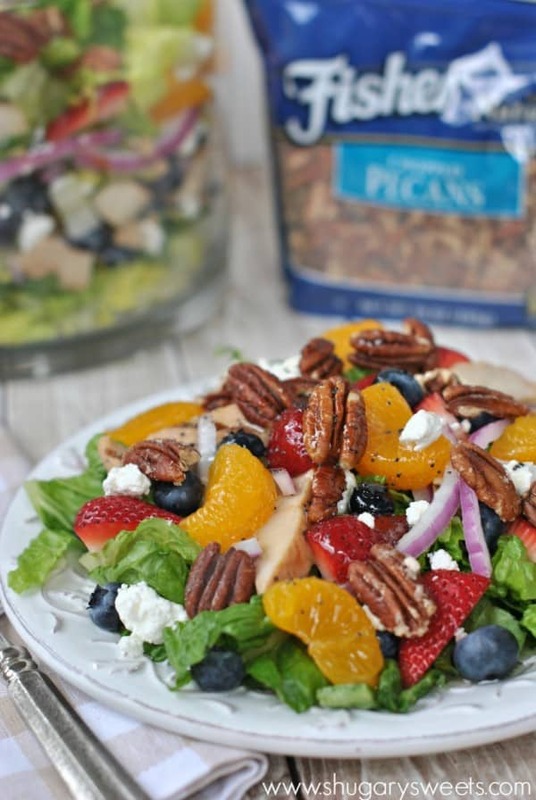 This Strawberry Pecan Salad is loaded with fresh berries and candied Fisher’s Pecan Halves. It’s also topped with a sweet, homemade lemon poppyseed dressing. Salads are one of the first things I’m drawn to at a potluck or BBQ. I love the unique twists people put on them, and I love that someone else had to chop up the veggies! Ha! Today’s recipe is super simple. I started by making some candied pecans. It only takes a couple minutes, and it’s worth the extra effort. By toasting them quickly in a skillet it brings out their nutty flavor. And adding a little sugar to the skillet gives them a sweet crispy coating! Just make sure you make extra for your salad, because if you’re like me you’ll be nibbling on them before you assemble! Bringing a salad to a potluck or bbq is always a great idea. Especially when it’s loaded with sweet, ripe berries too. This salad reminds me of my favorite one from Panera, that’s only available in the summer. I added fresh strawberries (from my garden! ), blueberries, and mandarin oranges. I also added goat cheese. I think it pairs so nicely with all the fruit in this recipe. You can use gorgonzola too, if you prefer. I also whipped up a quick dressing. If you’re not eating this salad immediately, hold off on adding the dressing. It’s best right before serving. You don’t need a blender or anything fancy for this delicious lemon poppyseed dressing. I have a little dressing pitcher, but a mason jar and lid would work great too! In a small skillet over medium heat, saute pecans with sugar. This will take several minutes for the sugar to dissolve as you stir the pecans. Set aside and cool. In a large bowl, combine romaine, berries, oranges, cheese and onion. Add diced chicken. Toss gently. In a small mason jar, combine dressing ingredients and shake with lid on. When ready to serve, add candied pecans and drizzle with dressing. ENJOY! That salad is looking amazing! I love strawberries in my salad! Looks yummy! Definitely going to give it a try. That salad looks so amazing! I’m gonna make it for the 4th! This is my most favorite type of salad!! Can’t wait to make my own! That is one fantastic looking salad, all those colors are stunning! I make a Mandarine orange salad that is similar to this and it is wonderful!! Greens with berries or fruit and a vinaigrette is our favorite. This looks wonderful! My favorite salads are ones I don’t have to make LOL Love combining fruit and nuts and some veggies in my salads. Love your blog! Thank you for offering a giveaway! Going to make this salad recipe this week. 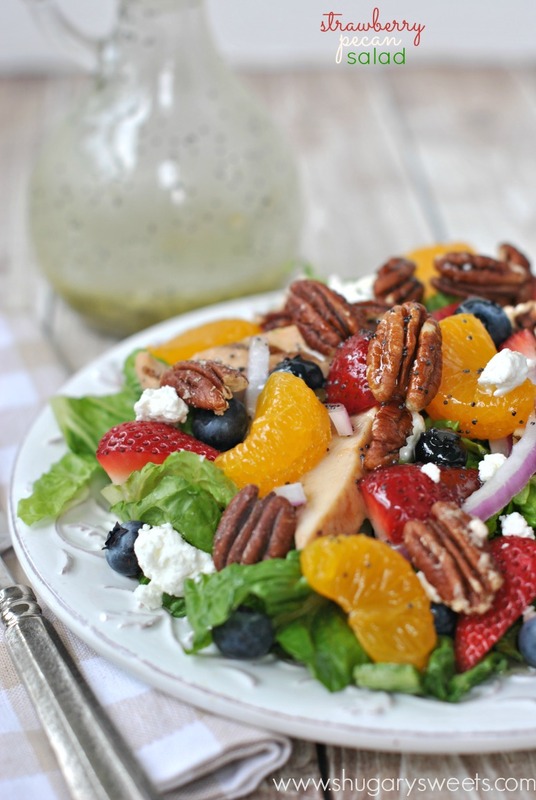 Summer salads are the best to eat on a hot day…especially your Strawberry Pecan Salad. I made one like this last year for 4th of July and it was a hit, I even doubled the recipe. Also, I’ve used store bought Poppy Seed dressing to save time. 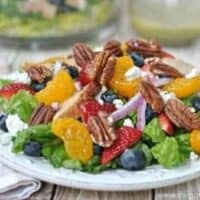 My favorite salad is one I make with romaine lettuce, mixed baby greens, mandarin oranges, red onions and candied almonds – the dressing I make is similar to the one you have made for this salad except without the poppyseeds (but now I’ll have to add them because I love poppyseed anything!!). Thanks for the continuing great recipes. 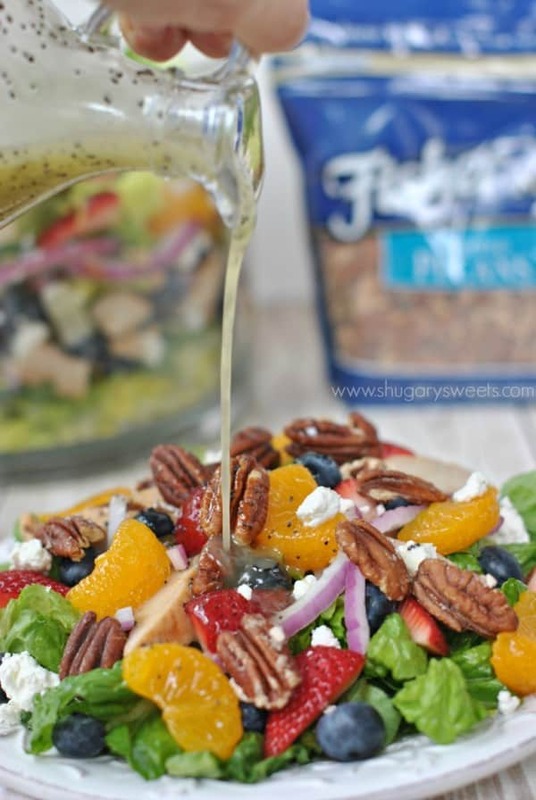 I love salads with fruit and nuts in them, and the lemon poppyseed dressing sounds wonderful! This is such a pretty, colorful salad, perfect for summer. You got all my favorites in this salad! Lemon poppyseed has my heart 🙂 and anything with fruit is a double thumbs up! Last year, I went from no fruit in my salad to all fruits in my salad and nuts compliment them so well. Gorgeous recipe, Aimee, pinned! I love salads like this with lots of fresh berries, but also love a good cobb salad. This salad looks amazing!!! I also love taco salads! 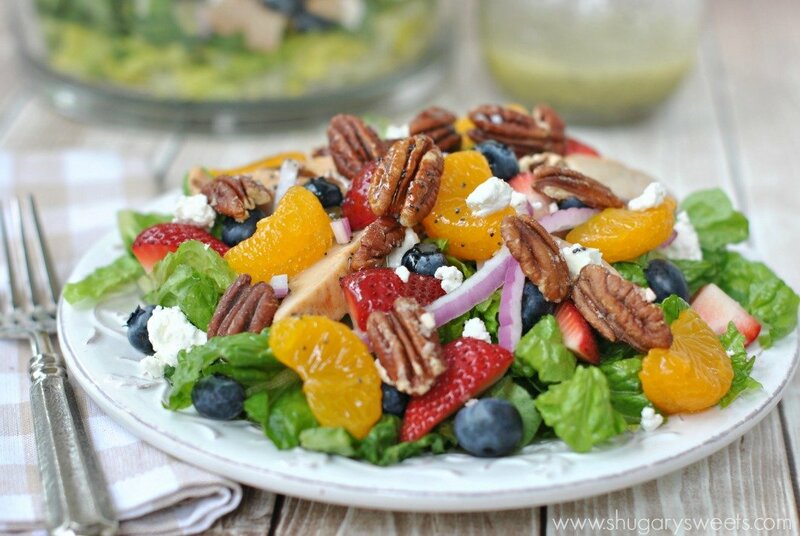 I love any kind of salad with sweet and savory components…like this Strawberry Pecan Salad! Looks yummy ! I love pecan salad, humm délicious !!! I’m a Caesar salad fan! Candied nuts are the best! This is a wonderful salad Aimee! Favorite salad is arugula, mandarin oranges and lemon tarragon dressing with shaved Parmesan. candied nuts + poppyseed dressing + pretty much anything else = HEAVEN. I’m loving this salad!! Goodness! That looks like a mighty healthy salad Aimee! Perfect summer lunch. Loving all the strawberries galore. Love salads with strawberries! I need to add this salad to my weekend menu! This is one of my favorite kinds of salads! Wow!!! That is one gorgeous looking salad!! I love all the fruits and nuts you have on this. And I definitely need to try the candied pecans!!!! I love my salads loaded with fruit – this is perfect for a summer dinner! My favorite salad is fruit salad with nuts, cherries, fruit cocktail, and marshmallows. Always reminds me of family. My favorite salad is a chef salad with apples and grapes and balsamic vinegar. Oh I really love the salads that have fruit in them! Especially for summer! The one you made looks so good! I have been eating & making a salad like this for years. I got the idea from a seafood place in Destin, FL that served the exact same salad. it is very good. July 6, 2015 – I’m making this salad again tonight !! The first time I added the pecans without the sugar coating and also the poppyseeds (did not have any on hand).. I added a comment on my Pinterest board after having it, but neglected to post directly to you. 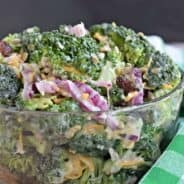 My husband and I love this salad !! A good way to get fruit into him, Lol ! It is on he menu again tonight (minus the chicken) . Thank you for sharing this keeper. I had for lunch today and I enjoyed it. I think I would like it even without the lettuce. Just made this for a simple, light dinner. It’s great! Pretty simple overall, even the candied pecans weren’t too hard 🙂 I had to leave out the goat cheese and poppyseeds but it was/is (I’m still chowing down!) an awesome salad! Can’t wait to have some for lunch tomorrow! I just stumbled on this and it looks amazing! I’m wondering if you’ve ever tried the dressing with honey rather than the refined sugar. Same with the candied pecans? I have not, but if you try it let me know! One of my favorite salads!!!! This was a beautiful, delicious hit for our 4th of July, family dinner yesterday! I had to make a couple of changes. I left out the chicken. Then had to use regular mustard and feta cheese because I didn’t have te other’s in hand. Finally, I added a bit of butter to the pecan – sugaring process to make the sugar stay. It was a success! Will add chicken this evening for a yummy, summer salad!! Love this salad. I added just a touch of cayenne pepper to the pecans …. gives it a little kick! This salad is absolutely delicious!!! I used agave and honey instead of the sugar in the dressing. I also used grape seed oil instead of olive oil. I did not candy my own pecans either… Trader Joe’s sweetened pecans were perfect. Mandarin oranges are so bland, I used a could Cuties instead. Can’t wait to eat it again tomorrow.